Double sided Fox Rig Racks provide a practical, functional and convenient system for hook link storage. The adjustable sliders accommodate a wide range of varying lengths and hold each rig under light tension. With coated, nylon or stiff rigs this induces a ‘set’ and results in neat, finely tuned presentations. This Short Rig Rack is designed to house 24 pre-tied hook links each of up to a maximum of 8.5 inches in length. 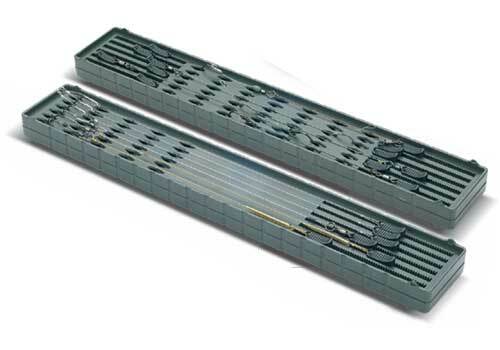 This Long Rig Rack is designed to house 12 rigs each of up to 11.25 inches in length. This Multi Rig Rack will house 6 rigs of up to 11.25 inches on one side and a further 12 rigs of up to 8.5 inches long on the other.